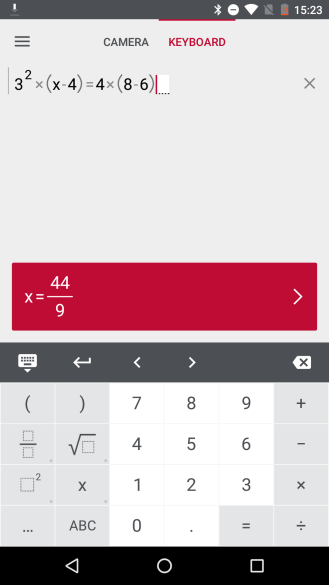 The signature dark red color is still prominent in the new app, but everything else has changed for the better. 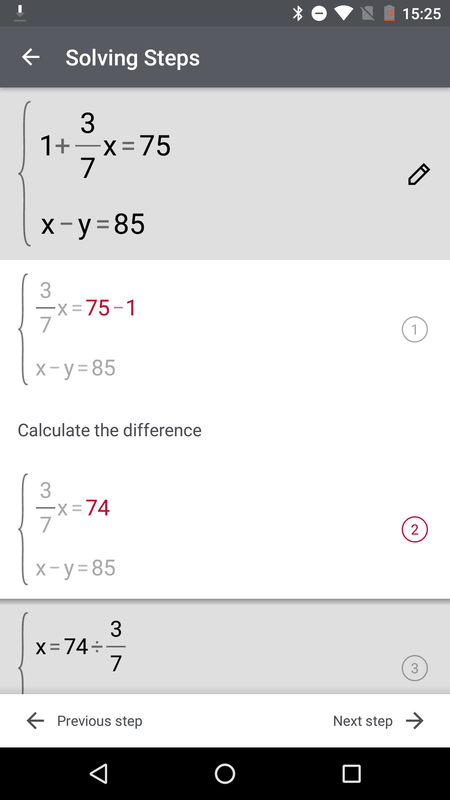 The interface uses a more modern design and iconography, cleaner lines, and easier to spot boxes for the problem (which can now be manually edited too) and the solution. 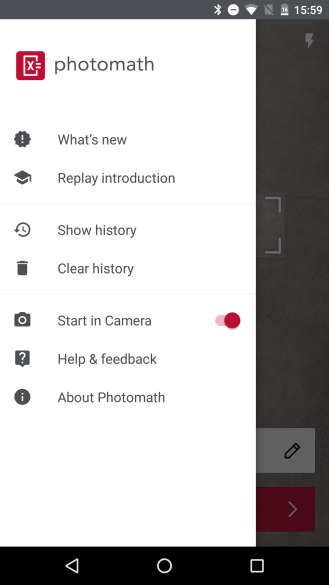 The new side menu doesn't bring that much to the table beside letting you access the history and set the app to always start in camera mode or not. 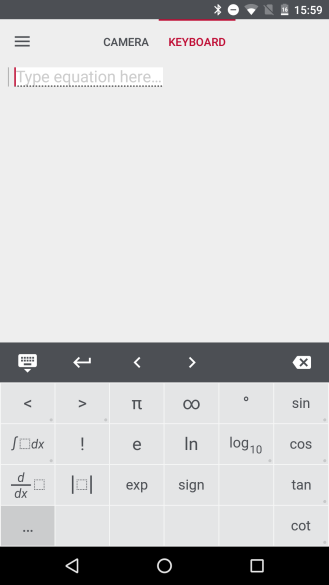 If you tap the upper button to switch to the new keyboard, you'll be greeted with a more traditional interface where you can manually enter your math equation. That's an awesome addition if you're trying to solve something that is handwritten and hence can't be recognized by the camera. 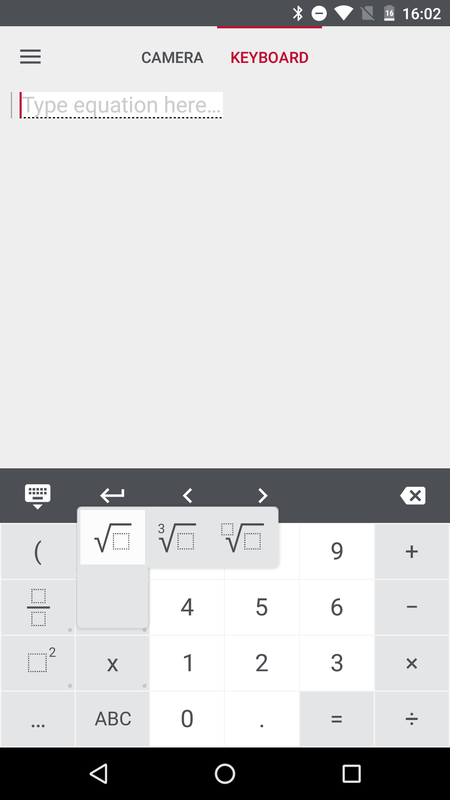 The keyboard has all the number keys as well as the most frequent symbols ready for you to use. 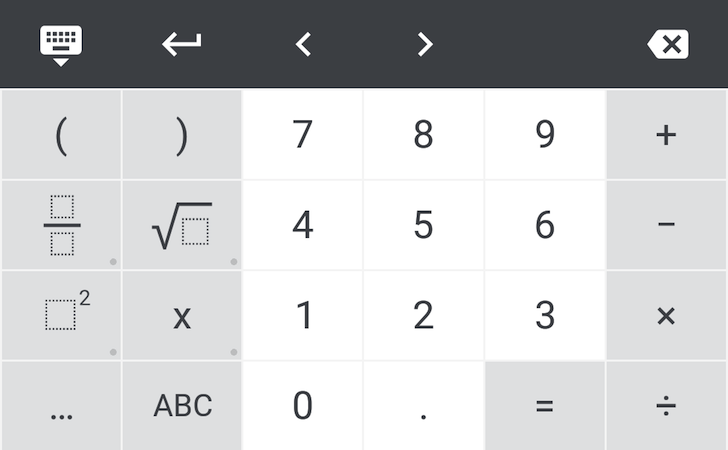 Buttons with a small dot in their bottom right corner can be long tapped to reveal more corresponding options, and the three dotted button reveals an extended keyboard with lots of other symbols and parameters to use. After you finish entering your equation, you'll see the solution in the red box below. 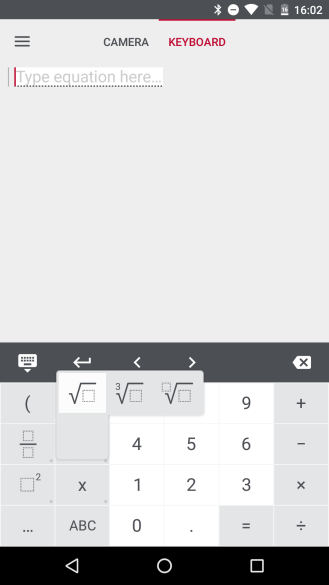 Hide the keyboard and it expands to reveal alternate formats for the solution (decimal or fraction for example). 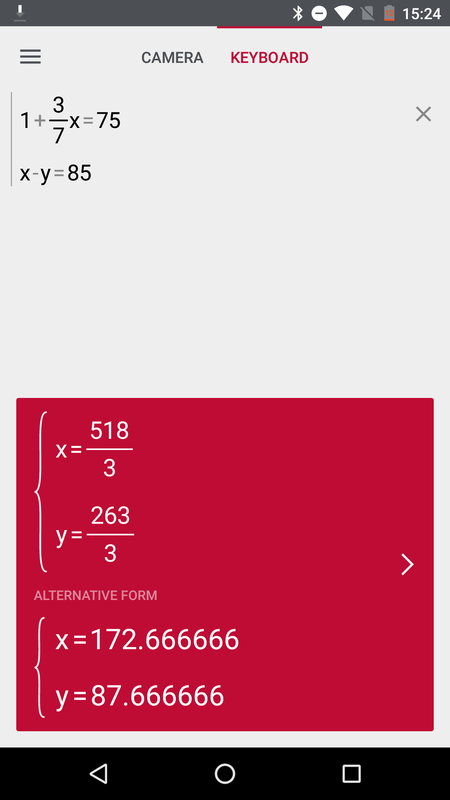 That red box takes you to the step-by-step solving screen where the different steps are outlined and tapping on one reveals in red the exact change that has been made to take you to the next. 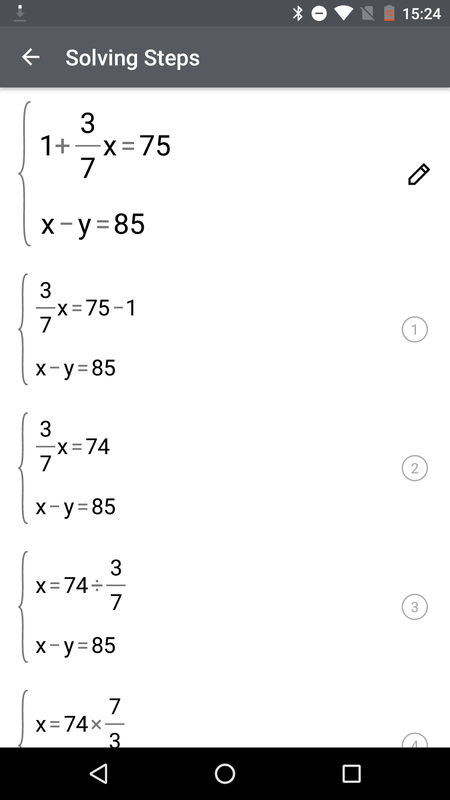 It's a fantastic way of following along and learning math. One last thing to note is a hidden cool features of this app. 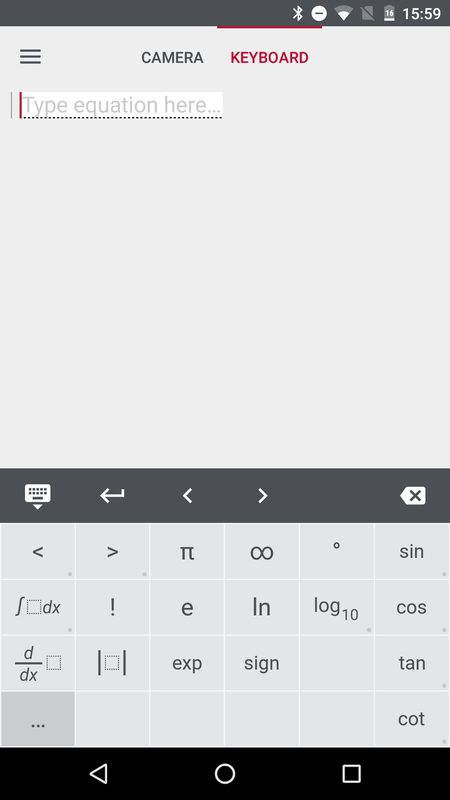 There's a sideways swipe gesture that goes through the history of problems and their answers. 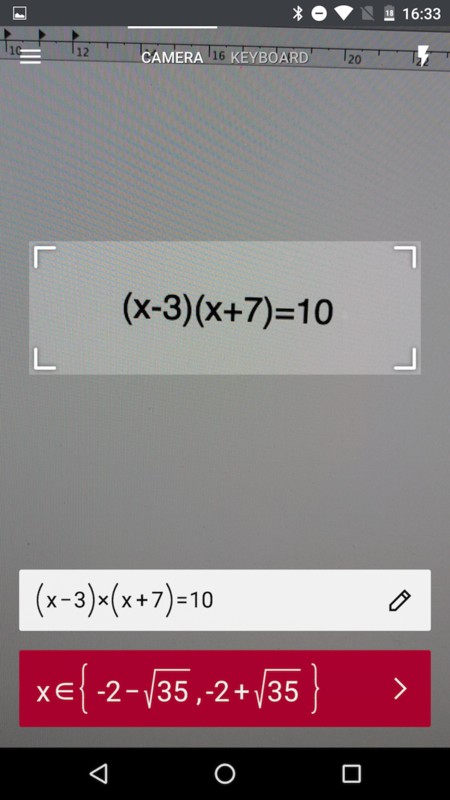 It works in both the camera and keyboard view and lets you quickly go back to a previous equation without having to access the history section from the side menu. PhotoMath 2.0 seems like a huge step forward for the app, if only because you're no longer bound to the camera and can type any problem or edit any wrongly recognized one. It's also a lot clearer visually and easier on the eyes. 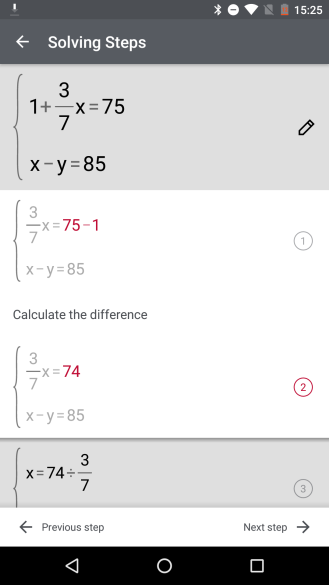 As someone who was always a math geek at school and college, this app revives my love of arithmetic in so many cool ways. I'm seriously tempted to just throw together some random equations and try solving them manually before checking the answer in PhotoMath. The app hasn't been updated in the Play Store yet, but you can access it by manually downloading the APK from APK Mirror. Here's the Play Store link just in case you want to try the old version and wait for the official update.